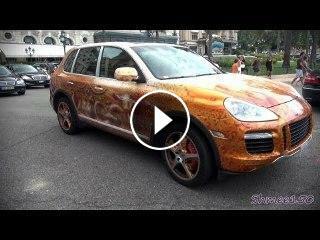 In Monaco it's not unsual to see all sorts of crazy cars and even wraps on cars but how about this Porsche Cayenne seen here in a bizarre choice of paint job. Yes, PAINTED! I'll let you make up your own minds on weather you like it but I believe the owners are Russian and also have a Mercedes SL55 in a similar style paint with alligators instead.